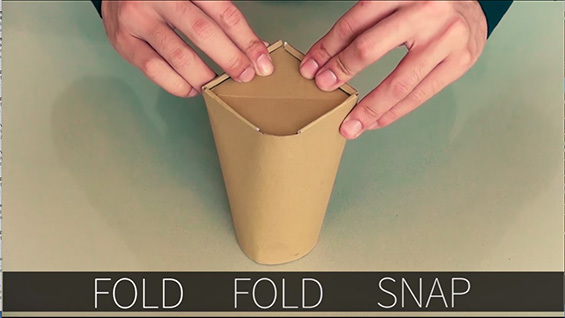 TrioCup, a to-go coffee cup with an origami-style no-spill lid first developed by two Cooper Union students in the 2015 Invention Factory has won $100,000 as part of the New Plastics Economy Innovation Prize, it was announced at the Our Ocean conference in Malta today. The original designers are Tom Chan ME'17 and Ben Ma ME'17. They took the second prize at Invention Factory 2015. 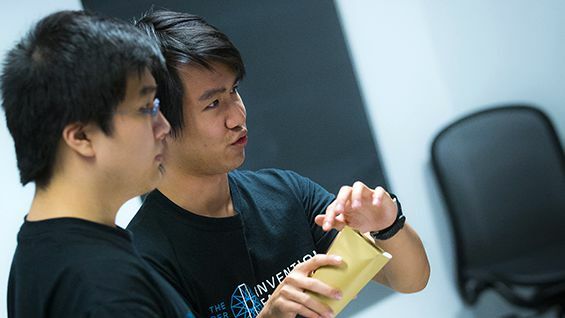 In 2017 Austin Wong ME'17 and Daniel McNulty II ChE'17 came on board to apply for the innovation prize. More than 600 innovators from over 60 countries from across the world participated in the New Plastics Economy Innovation Prize, according to organizers. The Prize is led by the Ellen MacArthur Foundation and was launched in collaboration with the Prince of Wales’s International Sustainability Unit. The Prize is funded by Wendy Schmidt, Lead Philanthropic Partner of the New Plastics Economy Initiative. The work was additionally supported by a challenge to, "get products to people without generating plastic waste" put forth by OpenIDEO, an open innovation platform. Two winners in each of three categories took home prizes that "rethink the plastics system and eliminate plastics packaging waste." TrioCup shared the prize for, "reinventing coffee-to-go. More than 100 billion disposable coffee cups are sold globally every year, yet today almost none of them (nor their lids) are recycled." The design is a single-piece coffee cup where folding over the top in a particular way makes it spill proof and eliminates the need for a separate plastic lid. It is also 100% compostable. "I wanted to create a more environmentally friendly beverage container and decided to do so for the more popular and less reusable container: the paper coffee cup and lid," Tom Chan says on the New Plastics Economy website. "Upon starting this endeavor, I realized that there were already patented all-paper cups that were not successful in the marketplace. Because of this, my team and I expanded the cup’s purpose to encompass more than just waste-reduction. We decided to also focus on cost-efficient manufacturing and user-friendliness, with spill-protection as one of the unique properties." Tom Chan, Austin Wong and Daniel McNulty II all took Engineering Entrepreneurship (EID 365) taught by Cooper alumni Jean Chung BSE'91 and Howard Rosenblatt EE'91 in their last semester and made advances in their work as a consequence. Professor Chung introduced the students to experts as well. Aside from the prize money, starting in 2018 the winning innovators will join a 12-month accelerator program in collaboration with Think Beyond Plastic, where they will work with mentors and expert advisors from the plastics industry and investor community to refine their design prototypes and scale them to become marketable solutions.